When the 1984 models made their debut, the model and engine ranges were just about the same as for 1983. The number of GLs variants, however, was decreased considerably, especially since they no longer were available in Sweden, Norway and Denmark. One result of this is that the combination single carburetor and automatic transmission reappeared for the first time in several years, although only on 900 GL. The 99 got new grill treatment for 1983. 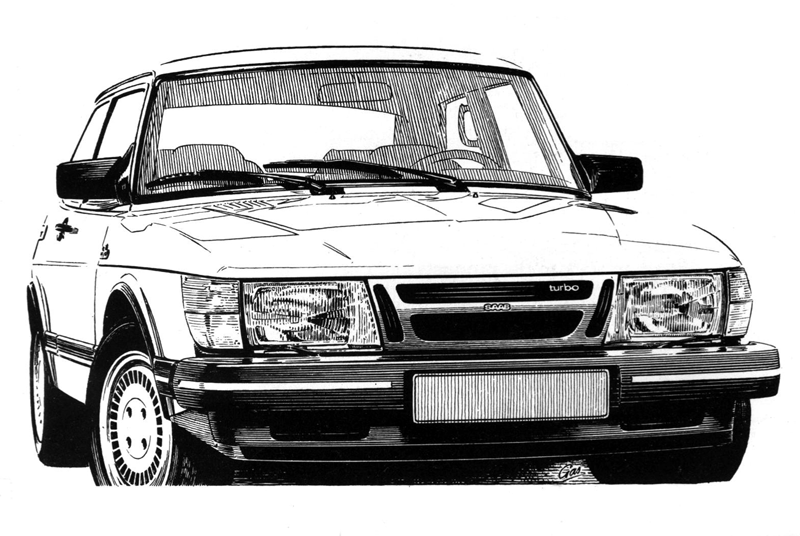 For 1984 the turn came to the 900 line, with a new center grill that makes the car look wider from the front, and which also means that all Saab cars appear with basically the same front-end treatment. Another styling detail was found between the ends of the bumpers and the front of the side moldings. For the 900 models these were joined with extra moldings to provide better lines and a more massive appearance. The alloy wheels that were introduced on the 1979 Turbos, with rims especially suited for Michelin TRX tires, were discontinued. Instead the new 1982 alloy wheels are used more widely, generally with 195/60 HR 15 tires. (This combination has been used on a few models for some time). Low-friction profile tires marked SR were also used on more cars. Of all Saab's 1984 models it was only the four-speed GL variants with single carburetor that rolled on conventional 165 tires. All five-speed 99 and 900 with 100 hp engine used 175/70 tires, while the GLs joined GLi, EMS and GLE in the 185/65 SR 15 group. 100 hp engine with automatic also meant 175/70 tires. New exhaust system for Turbos (for lower sound level both outside and inside), modified A-frame bushings for the 99 front suspension; halogen headlights on all cars for USA (earlier only on Turbo); power windows on four- and five-door models; speed control and delayed shutoff for interior fights in Turbo De Luxe and CD; all cars above the GL level (except 900S) got a new sporty steering wheel; the wheel in the 99 had a different angle. And in all Saab models, the distance between seat and ceiling increased by about 20 mm thanks to lowered seat pads. Plush upholstery, as earlier used in Turbo De Luxe, was also incorporated into a number of market variations of both GLE and regular Turbo. Finally, breakerless electronic ignition, earlier used only on Turbos and cars destined for America, were specified as standard for all engine variants in both the 99 and the 900 rangers. Here are most of the new appearance details on the '84 Saab 900: new grill (like 99); the same alloy wheels on all Turbo; molding blocks between bumpers and side moldings, both front and rear; dark front spoiler and black surround for the rear license plates on EMS and 3- and 5-door Turbos. • NYKOPING - 1,150 employees. Division managemant and marketing organization. Sales companies Saab-Ana and Ana-Maskin AB. Central parts storage. Components manufacturing: exhaust systems, seat frames, etc. • TROLLHATTAN - 6,000 employees. Development and production of passenger cars. • ARLOV - 360 employees. Assembly of Saab 900. • KRISTINEHAMN - 400 employees. Components manufacturing: rear axles, front ends, interior details, wiring harness, etc. • KRAMFORS - 300 employees. Component manufacturing: electrical circuits. • UUSIKAUPUNKI, FINLAND - Oy Saab Valmet Ab (50% owned by Saab-Scania). 1,450 employees. Assembly of Saab 99-900. • GOTEBORG - 760 employees. Factory is pan of Scania Division. Manufacturing of transmissions for cars. • SODERTALJE - 470 employees. Factory is part of Scania Division. Gasoline engine production. The entire Saab-Scania group during 1982 employed an average of 40,311 persons in 108 communities in Sweden and in 25 countries outside of Sweden.